I've been using running rigs for most of my carp fishing over the last couple of years as I think they offer the carp something different from the norm to deal with and I like their simplicity. Having seen underwater footage of carp using the lead to shake the hook out of their mouths it makes sense to me to have the lead running to try and prevent this from happening. Although I've had a lot of success with running leads I wanted to try a rig that offers more initial resistance from the lead (to help set the hook) before it becomes free. The rig I've been using recently uses the Strategy Run Rig Rubbers which offer a solution. The right-hand picture shows the inverted rig. When the rig is picked up the lead grips the rubber and does not slide down the leader until it is shaken free. Note that I am using a Strategy lead which fits the rubber perfectly (and has a sunken swivel offering a more direct contact with the lead on pick up). 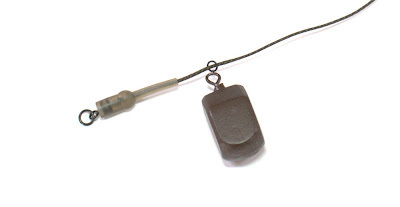 If using a different make of lead you may have to crush the eye of the swivel to ensure it grips the Run Rig Rubber and gives the required resistance. A disadvantage of the traditional running rig set up is that it won't eject the lead should it become snagged or drop the lead on the take if required. I would only use the above rig over a relatively clean lake bed. If I am fishing snaggy or very weedy waters I will thread a rig ring on to the leader and attach the lead to this with a 'rotten bottom'. The weak mono link will break as needed to lose the lead. You can attach the lead with PVA string as well to offer extra security when casting. The version below uses a 4mm ring which sits tightly over the rubber. I don't use any kind of back stop on the leader. If the worst happens and the line parts, the lead can pass unhindered over the end of the leader and a fish won't be left trailing the lead. You can use any leader material or tubing with this rig or even no leader if you're not a fan of lead core or the water you're fishing bans it's use. Obviously you will lose some of the bite sensitivity of a free running rig but for me that's not the main reason I've been using running rigs. Whether the Resistance Running Rig will be any more effective than a normal one, only time will tell.